Library Wars, a new live action movie based on the anime and novel series of the same name, was released in theaters across Japan just over a week ago. It is everything from a war story to a light-hearted romantic comedy. But at its core, it remains an excellent social commentary on the dangers of censorship while still giving the viewer an engaging story. Fahrenheit 451 is a 1953 novel that explores a society where books are outlawed and government censorship reigns. Library Wars presents a similar world, where after certain books become banned by the national government, local and regional governments created their own laws that allowed libraries the ability to protect any book, regardless of whether it was banned or not. After censorists begin attacking libraries and burning them, the libraries formed their own armies for the sake of protecting the books and knowledge within. Set in this world, Library Wars is not only a social commentary on the dangers of censorship but also a personal story about a strong woman living life, hunting for love, and striving to find her place in the world. On the other hand, it is a war story brimming with action. In many ways, it is the perfect way to introduce the social issues in a way that will entertain both young and old, male and female alike. 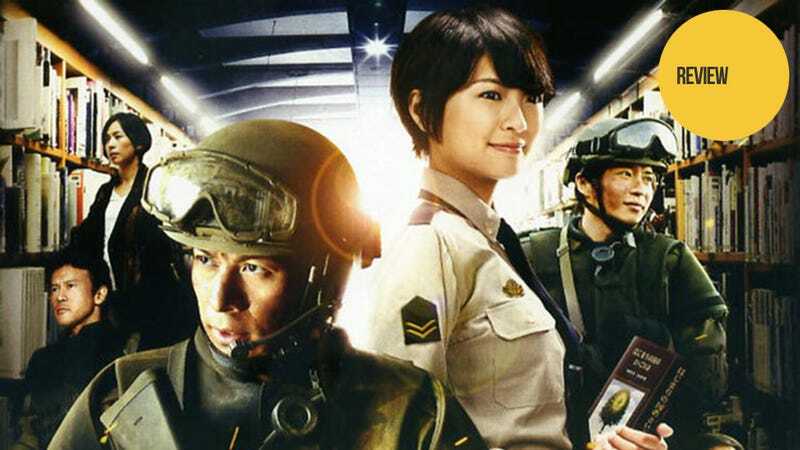 In comparing the live action film to the anime, there more than a few changes—the worst of which involves the classic, cop turning in his badge and going rogue shtick. However, the rest are all for the better when making a two-hour adaptation of the story. To start with, there is far more action. Not only are the war scenes longer and more climactic, a hostage situation that ends within seconds in the manga is spun into a tense action scene that serves as the movie's climax. The other major change is the “bad guy” of the story, which was little more than a mob in the anime, now has a face in the form of a terrorist leader responsible for the burning of a library, murder of civilians, and crippling of the Library Defense Force commander. The climax of the film becomes much more enjoyable as our heroes get to face down this villain and show what they are capable of on a more personal scale. The most important thing when doing a live-action adaptation of an anime with well-known character designs is to make sure the actors match those designs. The female lead, Iku Kasahara (Eikura Nana), and the male lead, Atsushi Dojo (Okada Junichi), are particularly well cast. And despite being the same height in real life, the excellent direction always manages to accentuate a large height difference between the two (a plot point in the story). The supporting cast is also quite well done with the characters being instantly recognizable to anyone who has watched the anime. I understand that despite being at war, the censorists and Library Defense Force, don't really want to kill each other. After all, it looks bad in the press if either side is doing lots of killing. However, even I, a person who only knows about war through games and history books, know that when you have literal ranks of men approaching behind bullet shields, chucking a grenade or flashbang into their midst is going to do a hell of a lot more than shooting the shields with a sub machine gun. The lack of any kind of explosive in the war scenes is further accentuated when a flashbang is used near the end of the movie—making viewers wonder why they weren't used many times before. More than that though, the battles are set up like trench warfare, where the enemies invade from barricade to barricade, pushing toward their objective. Of course, this is more than a little silly as all the defenses are set up to face the libraries’ main gates. But as we see numerous times that there are other, often unguarded entrances (not to mention the possibility of breaking down a wall), it makes both the censorist soldiers and the Defense Force seem laughably foolish—like two ranks of soldiers lining up to shoot at each other a la in the civil war. Library Wars is a movie that manages the rare feat of being both deep and entertaining. On one hand, it addresses the implications and fallout of government-controlled censorship. On the other, it presents an entertaining movie filled with entertaining action, comedic moments, and deep characters. If you enjoy action movies, romantic comedies, or thought experiments centering around censorship, Library Wars will not disappoint. Library Wars was released in Japanese theaters on April 27, 2013. There is currently no word on a Western release.